French Bulldogs (aka Frenchies) are great pets for families with children, as well as active seniors and singles. 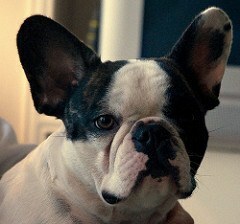 The French Bulldog is known for its cute, bat-like ears, short stocky build, and adorable face that always looks happy. This breed does well in large spaces as well as apartments and they are known for being easy going, loving, and having funny personalities that always surprise their owners. So, how do you keep this amazing dog entertained? French Bulldogs are toy bulldogs originally bred in England. Eventually they became popular in France, and then America, proving that no one can resist this breed’s adorable face and demeanour. This breed has a soft, short coat with loose wrinkled skin on its shoulders and head, giving them the appearance of cute furry babies with rolls. As a smaller breed of bulldog, the French Bulldog reaches approximately 22 to 28 pounds. French Bulldogs are very cuddly and playful, perfect for kids and all types of dog lovers. Even though they usually form a special bond with one person, French Bulldogs will have enough energy to keep a whole family entertained for a while before getting pooped out. How Does a French Bulldog Like to Play? Like most dog breeds, French Bulldogs require at least a walk a day and should get plenty of exercise to help maintain a healthy weight. Since French Bulldogs can be easily affected by the heat, playtime should take place inside on warmer days. Since French Bulldogs are known for their playful natures, all it takes is a ball or chew toy lying around to keep them preoccupied. A couple of things to keep in mind when playing with and training this breed is that sometimes, French Bulldogs can be stubborn and aggressive. The best way to deal with this is to discourage bad behavior and train them gently with positive reinforcement. Ultimately, French Bulldogs want to please their owners so giving them plenty of opportunities to do so will keep them content. To make sure that aggressiveness doesn’t become an issue, it is important that French Bulldogs are socialized with strangers and other animals early on. Toys you buy this breed should also be able to withstand their aggressive play. One fun way to get a French Bulldog running and playing with other animals is bringing them to a dog park. Doing this from a young age is a great way to make sure that a French Bulldog gets properly socialized. Dog beaches are also an option but keep in mind that due to their short, stocky legs French Bulldogs are not great swimmers. Since French Bulldogs are an active and playful dog breed, freestyle play is also a great option. This is when owners basically dance around and play with their dogs themselves. Believe it or not, it’s an organized sport that people do in competitions! Don’t worry, you can do choose to do this freestyle play in the privacy of your own home if you prefer. Be sure to also check out our article on sports to keep your dog active. French Bulldogs love to play with their owners, and fetch is no exception. This breed of dog is eager to please and will happily run to get a thrown toy and bring it back to its owner. 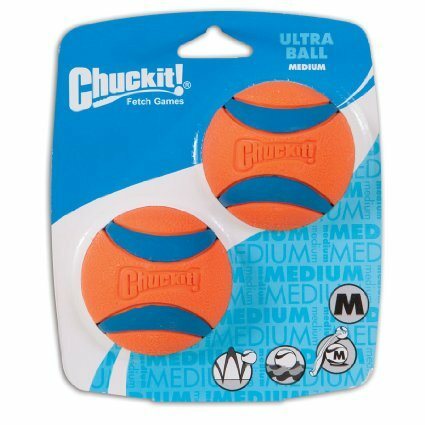 One great toy for throwing with a French Bulldog is ChuckIt, a tough tennis ball meant to withstand dogs’ teeth. It's a favorite among dog owners and withstands endless hours of playtime. A sure winner for your dog toy arsenal and one that will wear out Fido in no time. It's bouncy, durable and made of rubber, so it's easy on your pup's teeth. Make sure you pair it with the Chuckit Launcher to help keep your hands clean (and save your back too!). French Bulldogs enjoy chewing on things, so its best if owners provide them with a healthy approved outlet if they don’t want their French Bulldog to start chewing their shoes, slippers, and anything else they can get their teeth into. An added benefit of most chew toys is that they are designed to help keep dogs’ teeth strong and healthy. 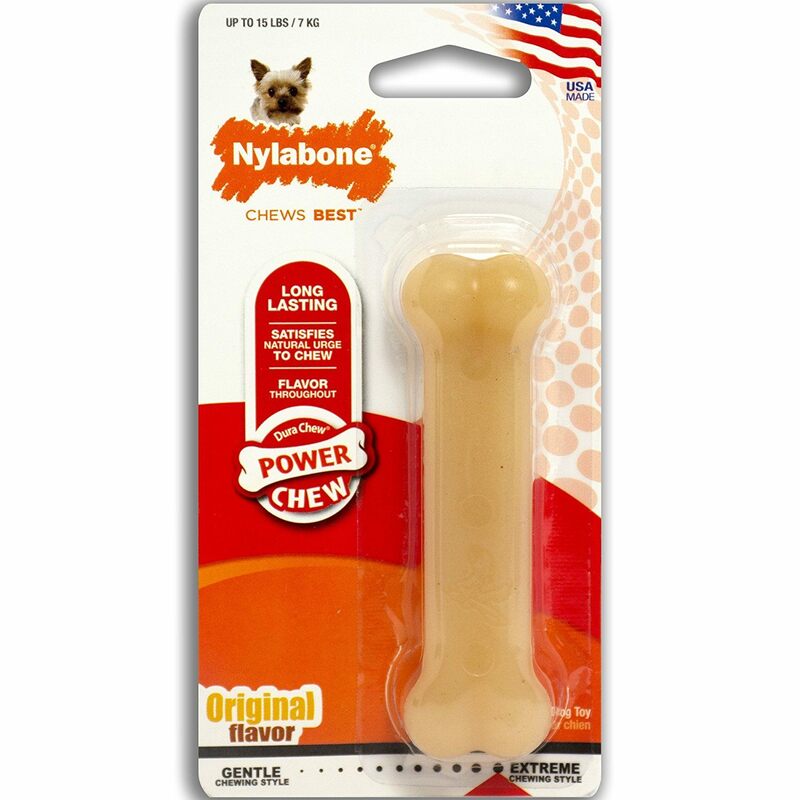 One highly recommended dog chew toy is the Nylabone DuraChew Textured Bone. It won't let you or your French Bulldog down! We particularly like this one since its raised edges will help control plaque, it's Vet recommended and made in the USA. It's available in small, medium, x-large and comes in a variety of flavors. French Bulldogs are quite intelligent, and love to work for approval and treats. 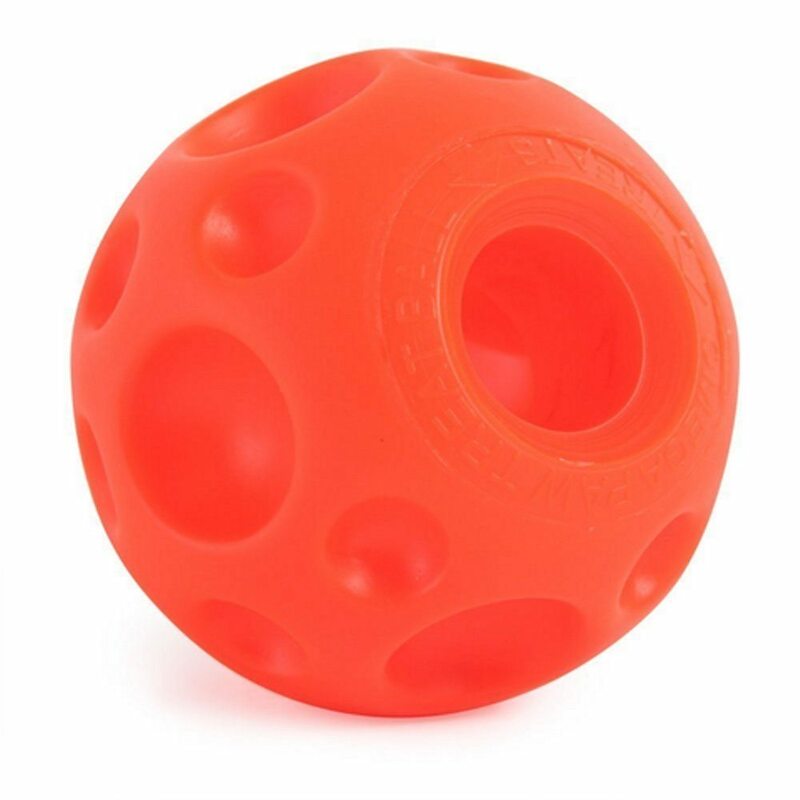 Treat balls like the bestselling O﻿mega Paw's Tricky Treat Ball﻿ can be a great way to keep a French Bulldog preoccupied while their owner is away or busy. Stuff it with your pup's favorite treats or dry kibble and as the ball gets rolled around, the treats get dispensed. This puzzle toy is available in a variety of sizes. It's durable so it withstands chewing if you have a heavy chewer on your hands. If you're looking for a puzzle toy for your Frenchie to keep him both entertained and mentally stimulated, try this one! 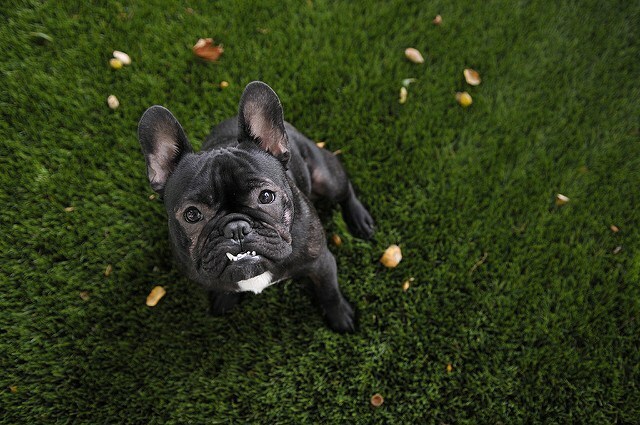 When choosing toys for their dogs, owners should be careful to make sure that they don’t have any small hard parts that a French Bulldog could potentially hurt themselves with or choke on. One example of a toy that owners found was not safe is the Kong Beast Dog Toy. This toy had a ball at the end without two holes and unfortunately restricted dogs’ air flow when swallowed or chewed on. That toy has been redesigned since, but it is a good example of things to look out for when shopping for toys for your French Bulldog! French Bulldogs are cute and playful dogs that make a great addition to just about any household or family. To keep a French Bulldog happy, owners should be prepared to give their dog a lot of affection and attention, especially during playtime. Owners should buy their French Bulldogs unbreakable dog toys that will keep them busy and give them something to focus their energy on throughout the day.